How do you connect with people from behind barricades? On Monday a group of Peacelights staff and volunteers took our message to Dag Hammarskjöld Plaza outside UN Headquarters on 47th St. Could there be a more appropriate venue than this, where so many people from around the world gather in the name of peace? Unfortunately, when we got to the site, we found that security was extremely tight. The area was completely closed off to passersby and we could occupy only a small area surrounded by metal barricades and about a dozen police officers. All our bags had to be thoroughly searched. Things looked bleak. We were hoping to form a spontaneous network of people connected to each other by bungee cords. But that was practically impossible now. Not only were we quite literally behind bars, but the only people permitted to pass by were UN employees hurrying to and from work. Nevertheless, we were determined to make the best of it, and we did. By the end of the day, we learned that even seemingly hopeless situations can be turned into something positive. Unexpected things can happen when you put yourself out there. If you come with a sincere commitment to spreading your light, it can shine in any situation. In a way, I think our event ended up being more powerful, even if it didn't necessarily go according to plan. Sure, it wasn't as interactive as we hoped. Police officers and busy UN employees were not exactly the audience we envisioned. But the contrast between our message and the guarded, closed off setting was powerful. The setting was actually very dramatic. In the fading light of the day, with the streets almost completely empty of cars and people, outside a building where some of the most powerful people in the world were gathered, here was a small group of people dedicated to a simple principle: connect for peace and take the time to really see another human being, no matter who they are. I think this all showed in a very striking way what the Peacelights message is, and how important it is. There were well-dressed UN diplomats hurrying to this or that meeting, but it occurred to me how peace could also be achieved by ordinary people and by much simpler means: by just taking the time to connect with one another. The UN is an organization that brings leaders together. But peace is about more than politics. Peace needs to happen at the level of individuals as well. 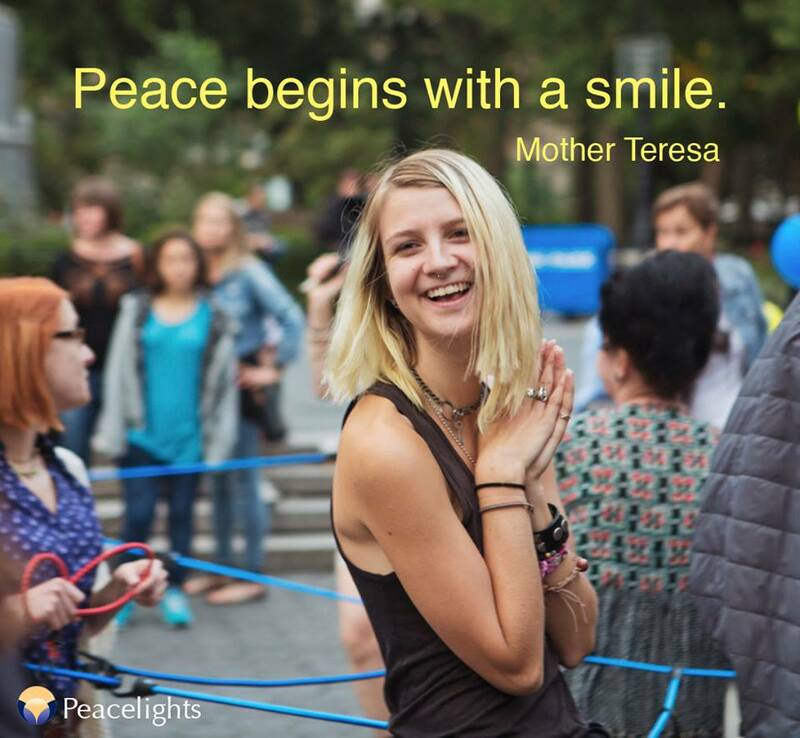 Peacelights brings individuals together, and this sense of connection is badly needed right now. We were not the only group at the UN that evening. To our right was a group demanding rights for the Palestinians. Further down was a group of Falun Gong practitioners silently protesting their treatment by the Chinese government. These groups had powerful messages, but we were the only ones who were actually trying to connect with new people, physically, emotionally, and spiritually. We were the only ones inviting people to join us in a festive, welcoming spirit. We had balloons and music. We had live performances by Peter Jam and our own Ivonne Reimann, who sang a composition written especially for Peacelights. Our bungee network was a physical embodiment of the bonds between us Peacelights volunteers, and between all people. By the end of the day, we actually succeeded in handing out most of our informational pamphlets. To be honest, I was genuinely surprised. Perhaps the busy UN employees were listening after all. And we actually did get one very enthusiastic young man to stop, move past the barricades, and join our circle for a while. The New York City police officers could not have been nicer. They were friendly and professional, and I think a number of them came to appreciate our message. There was even a moment when the police officers guarding the area joined us in handing out flyers and encouraged passing diplomats to say, “I see you.” And occasionally, a teary eye from some of the younger officers. If you had told me at the beginning of the event that it would be this successful, I would have laughed. But sometimes you just need to focus on shining your own light as powerfully as you can. You can't worry too much about what is coming back to you. Just keep shining and have faith that eventually it will reach where it’s meant to reach.